As we work with you, we like to capture the highlights of intimacy and romance between you and your groom. We prefer to document your story rather than direct it, so all your wedding pictures will look perfectly natural. Let us help you make your Insignia Steakhouse wedding ceremony and reception a truly memorable occasion. This venue is located in a historic Hamptons-style mansion, complete with copper roof, cedar shakes, and quarried stone. You can have it all to yourself for your wedding ceremony and reception. You can choose from two spaces at Insignia. The Main Indoor Space: This facility has the capacity to accommodate up to 250 guests. The central large dance floor has plenty of room for all your friends and family. Thanks to the comfortable atmosphere in the mansion, your guests will feel right at home. The Outdoor Space: This space features covered and uncovered areas. If you decide on an outdoor wedding, the lush grounds have various backdrops which will add a romantic touch to your special event and will provide excellent photo opportunities.  Long Island’s Insignia Prime Steak and Sushi is a traditional steakhouse that makes a classy venue for your seated wedding reception. The venue offers a superb dining experience with a style and taste that is unique. The extravagant bar area is perfect for celebrating and enjoying a great conversation. You will find the service and cuisine exceed your expectations. Insignia’s virtuoso menu features outstanding prime dry-aged steaks as well as excellent fresh seafood. You can impress your friends and family with dishes such as Marinated Skirt Steak, Porterhouse Veal Chop, Chilean Sea Bass, and Scottish Salmon. For sushi and sashimi connoisseurs, the menu will not disappoint. Succulent, fresh seafood dishes abound. Madai, Red Snapper, Toro, Fatty Tuna, Spicy Salmon, and Hirame, Fluke are just a few of the mouthwatering options. All meals are served in an ambiance that is perfect for sharing a celebratory meal with friends and family. The mansion is just for you and your guests. They only book one wedding at a time. The Hamptons-style mansion has modern, chic décor throughout, making it a unique departure from many wedding venues. We can’t wait to meet you and your groom and start to get to know you better. Let’s get together so you can tell us all about your wedding plans and we can show you our wedding portfolio. We are certain you will appreciate our varied experience and our different photographic styles.